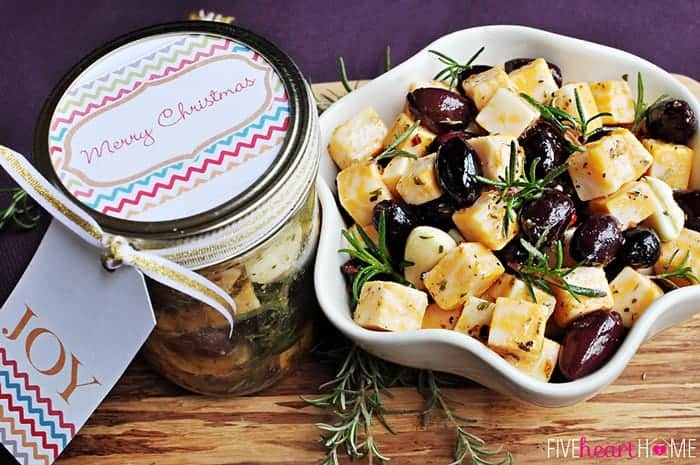 Home » Recipes » Appetizers & Snacks » Marinated Cheese & Olives ~ An Easy Appetizer or Food Gift in a Jar! 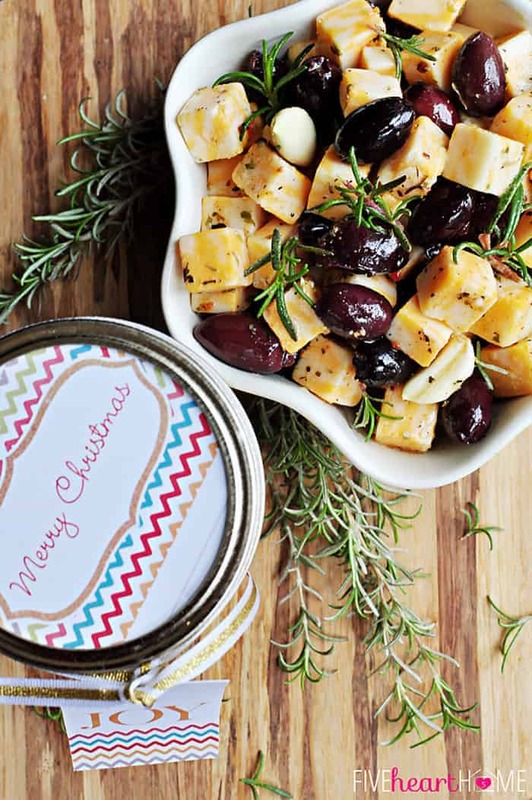 Creamy cheese and briny olives are marinated in an herb- and garlic-infused dressing for a quick, attractive appetizer or a fun and easy food gift in a jar! Are you done with your Christmas shopping yet? Because I have hardly started, and I’m needing some commiseration from my fellow procrastinators here. But I have a big date with Amazon on the roster this week, after which I hope to have my gift-deficit issues resolved…wish me luck! Aside from the presents I need to buy, I also have a list of gifts to make. And let me tell you…this year, I am all about quick and easy. But of course, I still want to give homemade goodies that will be enjoyed and appreciated. And what’s more fun than a food gift that you can plop in a Mason jar, jazz up with a cute tag (like the free printables pictured here! ), and call it a day? 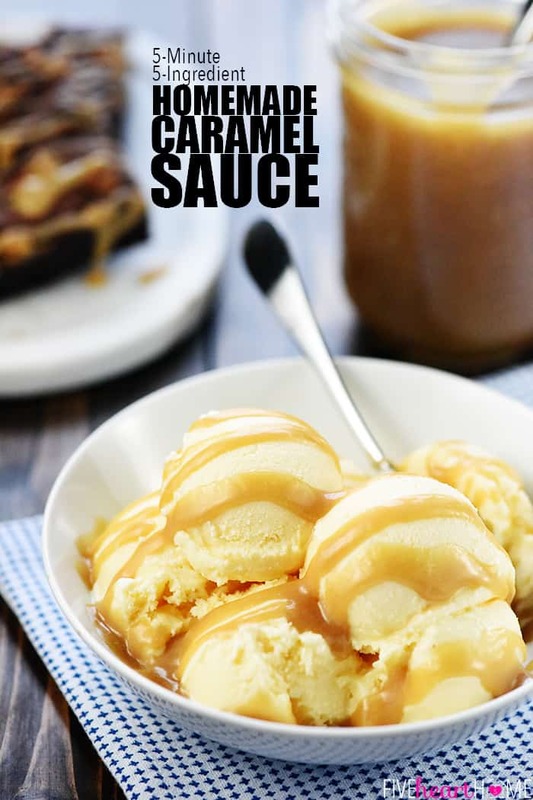 A few weeks ago I shared a yummy homemade caramel sauce that makes a perfect gift, because not only is it delicious, but it also takes only five minutes to make. However, it’s easy to get sugared-out over the holidays, so if you’re interested in giving a food gift that’s savory rather than sweet, I have another option for you today…and it only requires about five minutes of effort as well! The secret here is buying ready-made ingredients and throwing them all together. Now I realize that you’re probably not in the habit of making your own cheese, and thus you typically already buy that ready-made. So when I say ready-made in reference to the cheese, I’m actually referring to the fact that you can buy it already cubed. No breaking out the knife and the cutting board…just dump it in a bowl! As for the marinade itself, you can just pick up a bottle of your favorite oil and vinegar or Italian-type salad dressing. Toss in some jarred Kalamata olives, dried herbs, and whole garlic cloves, then let the whole shebang hang out in the fridge for awhile. Seriously…you know a recipe is fast when peeling the skin off of six cloves of garlic is the most time-intensive step. This combination of mild, smooth Colby-Jack, salty olives, bright herbs, and zesty dressing is not only tasty, but it’s also got eye appeal. This combo looks so pretty piled in a bowl as an appetizer, and it’s just as lovely spooned into jars with sprigs of fresh rosemary for gift giving. And the taste? Well, it’s quite addictive. Even if you don’t like olives, you’ll want to pick around them because the marinated cheese is simply delicious (just ask my kids). 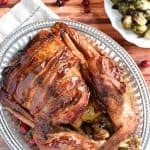 I hope this recipe comes in handy for you this holiday season as you hit festive parties and put together homemade gifts for friends and neighbors. It’s pretty, it’s tasty, it’s quick and easy, and you can make it in bulk…now how can you beat that? In a large bowl, gently combine all ingredients except rosemary. Cover and refrigerate for at least 8 hours and up to 24 hours. Divide cheese and olive mixture between 6 glass jars (such as pint-sized Mason jars), making sure there's one garlic clove in each. 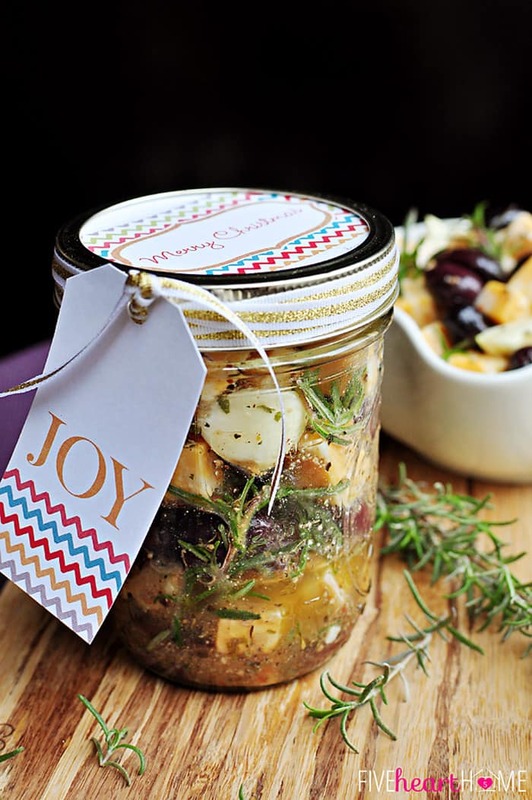 Place a sprig of rosemary in each jar and pour remaining dressing into jars, dividing evenly. Store in refrigerator for up to two weeks. You can use your favorite variety of cubed cheese, but something mild will absorb the flavors of the marinade nicely. 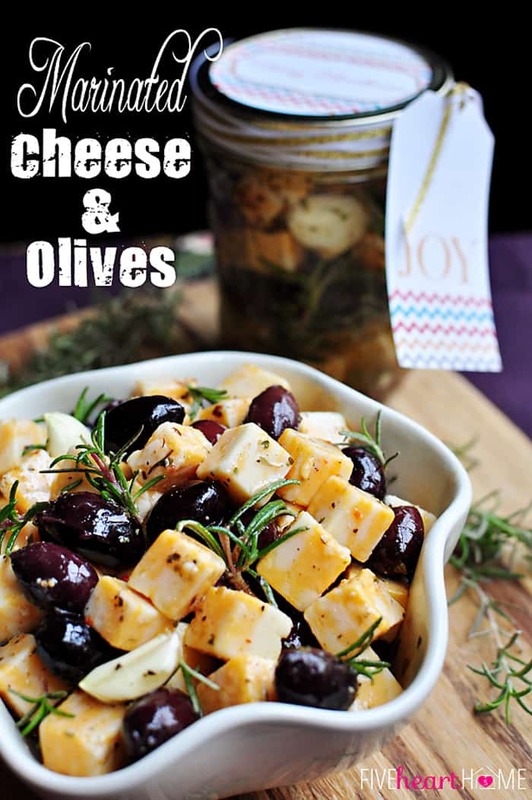 You may use a jar of olives anywhere from 10 to 15 ounces, depending on the ratio of olives to cheese that you prefer. I highly recommend Kalamatas for this recipe (as opposed to regular black olives). Finally, use a good quality salad dressing, since that's a prominent flavor in this recipe. 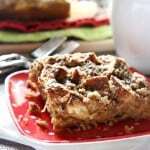 Adapted from Southern Living 2010 Ultimate Christmas Cookbook. And the beautiful holiday gift tags can be downloaded at Living Locurto! What a great appetizer! Quick, easy, and right up my alley! Thanks for sharing, Samantha! Thanks, Liz! One can never go wrong with quick and easy. That’s about all I can handle at this crazy stage of life anyway! 😉 Hope you stay warm and have a great weekend…thanks for stopping by! I am going to make a jar for one of my foodie friends, a jar for myself and have this at my wine tasting party. That sounds like a perfect plan, Stephanie! This recipe makes a lot, so you should have plenty to go around. 🙂 Have a wonderful weekend! What a great idea for a gift! I have several friends that would rather have savory than sweet. Perfect! Glad to hear it, Toodie! Hope you and your friends enjoy! 🙂 Thanks for stopping by! Ok, love how quick and easy this is. Plus, I am a huge Kalamata Olive lover. 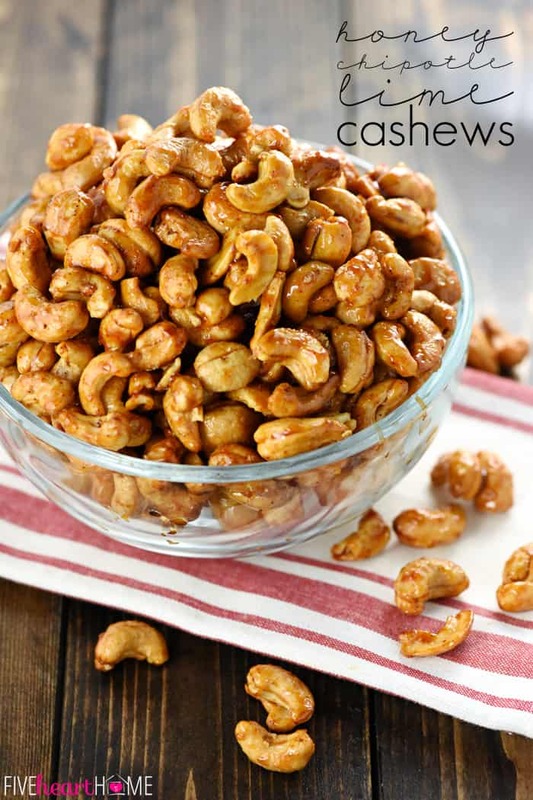 This recipe is perfect and such a cute gift idea. Thanks for the great idea, pinning! Aren’t Kalamata olives fabulous?! 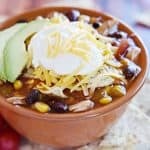 And yes, this recipe is so quick and easy…always my favorite part! Thanks so much for the pin, Krista…hope you’re having a great weekend! Yes! 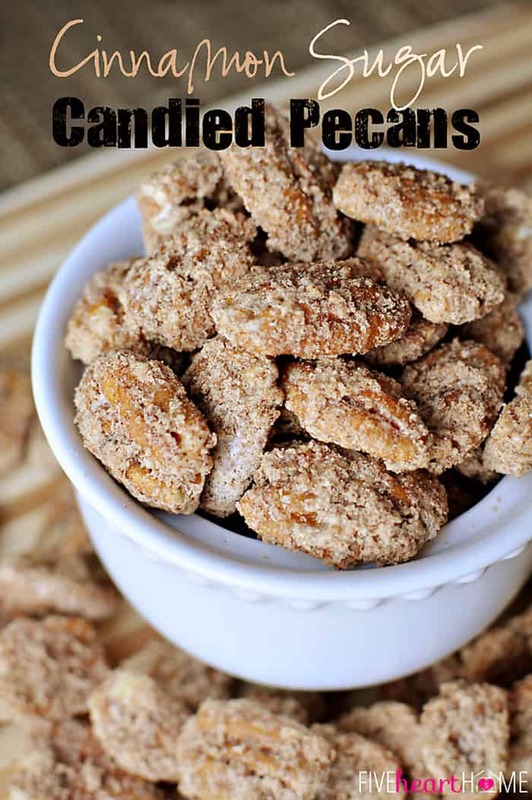 I actually use to not like them because they were too salty for me, but I love the tanginess to them now! 🙂 I hope you have a wonderful weekend as well. wow, what a fun gift idea! Samantha, I absolutely love cheese and olives and would devour this bowl in a nanosecond! 🙂 Thank you so much for joining us and sharing at Best of the Weekend! Hope you are having a wonderful Saturday! I did devour a whole bowl of it in a nanosecond, Cindy…fortunately, I gave the rest away after that! 😉 Thank you so much for stopping by…I hope you’re having a warm and wonderful weekend! I love this! 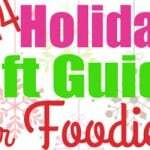 What sophisticated take on traditional food Christmas gifts! I would be thrilled if you shared this over at my link party today! OOOO that sounds SO good! I need to try this asap! I think you’ll love it, Lyuba! It’s pretty amazing for those cheese and olive fans out there. 🙂 Enjoy! This looks wonderful. I am assuming that it tastes better the longer it marinates. How far in advance to you recommend making this? Hi Jenny! I think overnight is plenty of time for it to marinate, although the flavor will continue to develop the longer you leave it in the refrigerator, of course. But honestly? It’s pretty good right after you make it, too. 😉 Hope it’s a hit! Any reason NOT to use manzanillas? That’s what I have on hand. Hi Shana! I think you can use any olive that you prefer. The final result is just going to taste like manzanillas instead of Kalamatas…but that’s okay, too! I do think I would avoid the canned black olives, though, because those aren’t very flavorful (at least in my opinion). 🙂 Enjoy! So for this recipe, you can use a basic oil and vinegar vinaigrette salad dressing for your marinade, OR you can use an Italian salad dressing, which is basically oil and vinegar dressing with the addition of Italian herbs and spices. I typically use Italian dressing in this recipe, but it’s a matter of personal preference. Would you have any recommendations for a good quality salad dressing? This sounds like a lovely, easy appetizer for my Thanksgiving get together. Hi Jo! (And I apologize for my delayed reply…I was out of town over the weekend.) I really like the Newman’s Own and Brianna’s lines of salad dressings. Newman’s Own has a good oil and vinegar, and Brianna’s has a yummy French Vinaigrette that’s kind of tangy if you’re into that. I’ve also made this recipe before using Ken’s Steakhouse Northern Italian Dressing, because that’s one that I always enjoy the flavor of in pasta salads. I think it just comes down to finding a salad dressing whose flavor you enjoy! Hope you find a good one to try and that everyone enjoys this as an appetizer at Thanksgiving. 🙂 Have a great week! Samantha, I made this and your Artichoke Bruschetta recipe for last night’s dinner party. Both were a hit. And the perfect starters before my gnocchi dinner. Thanks for sharing. I would love to make this for gifts for my guests at Christmas party. Is there a way to seal it so I can make it ahead? I’ve never tried sealing this recipe in jars, Jo Anna, and I can’t really advise how you would do that. But you can make it up to two weeks ahead of time and store in the refrigerator, if that helps? I’ve used your olive recipe for pre-packaged food items on the go at my Daughter’s coffee shop and cafe named Reverie in Wichita, Kansas and it’s become one of their best sellers. The head chef wanted me to figure out something we could do with Olives and i found your recipe. I have added some crushed up red pepper flakes for color. Thank you, Your recipe rocks and it’s so simple. I apologize for any confusing wording, Lindsey…I just clarified the recipe to make it clearer that whole (crushed as in smashed) garlic cloves should be used.